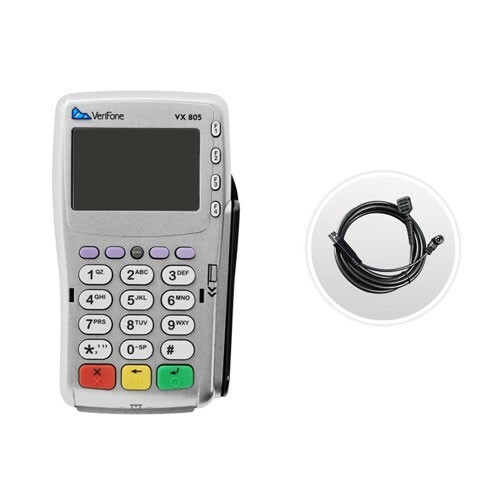 The VX 805 offers large and small retailers excellent value with full functionality and reliability. 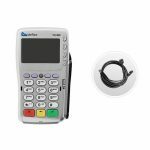 Merchants can process a variety of transactions, including EMV (Chip Card), NFC/Contactless (Apple Pay) and Magnetic Stripe. The advanced consumer interface is highlighted by a 128x64 display, large keypad, ergonomic design, and intuitive card inputs—features that provide exceptional ease of use in any condition. Includes all necessary cables and debit key encryption. Counter stand optional, but recommended to prevent accidental damage, which is not covered under the 1 year warranty. Sales tax & shipping added on separate invoice, or you can request a complete price quote before ordering. Just be sure to include the number of PIN Pads in your request. Standard shipping is FedEx Ground. Contact us if you need faster shipping. Note: Integrated EMV processing requires a subscription to Datacap's NETePay software (plus GIFTePay, if processing Gift cards). Contact us to order, to ensure this device is compatible with your processor configuration. If you want to use integrated EMV merchant processing with StoreTender, you will need to obtain a license for Datacap Systems NETePay™ software from us - an authorized NETePay™ reseller. NETePay™ is priced per store and one lane (register) is included in the base price. Specify the number of additional lanes (registers) you have to arrive at the final price. Contact us prior to ordering, to ensure this software is compatible with your processor. GIFTePay™ from Datacap is the software that enables POS software to interface to the leading Gift Card platforms in the world. Using GIFTePay™ your POS will integrate seamlessly and efficiently to process gift card payments and keep your lines moving smoothly. If you are not already accepting Gift Cards in your store or restaurant you are missing the boat. GIFTePay™ is priced per store and one lane (register) is included in the base price. Specify the number of additional lanes (registers) you have to arrive at the final price.